Good morning and happy Tuesday, Belles & Beaus! It’s no secret, I have a vinyl addiction. My collection stands at 200 plus albums – not including the small collections that came together that my great uncle had. I love going to record stores and searching for albums that I want in my collection, even better when they’re in almost brand new condition and I only paid a couple dollars for them. And of course to play said vinyl albums, you have to have a great player. I’ve had a Crosley before and it ended up quickly being gotten rid of when it stopped playing well. To be honest, figuring out how to replace the bands on those things are not worth the effort. The one I had though had a function to rip the audio from the vinyl so that you could put it in your iTunes. And though my uncle proved that vinyl was the purest form to capture music, I still like to have my music on my phone to listen to in the car. The clicks, pops, and white noise are just an added plus. My system wasn’t all that expensive to be honest and I love it a lot. I officially have had it for a year – about the same amount of time as my Crosley – and I’ve had none of the issues I had with the prior one. And trust me, I knocked on wood after I wrote that. And the reason it is called a 3 speed – for those who don’t know about record players – is because there are three sizes of records 33 (which is the normal big 12×12 vinyl covers), 45 (which has one song on either side), and 78. Now I’ve never encountered the last one so I’m unsure of what they look like. If I ever do encounter one, I will definitely make sure to buy it so we can all have a good look at it. Our local record store in Florence called Nu Way Vinyl is really great and it was the model that they recommended when I told them what I wanted from it. I need to get better speakers because the ones that came with it are not the best quality. But they’ll work for now. But this little baby does everything I need it for. It plays my records, balances very well, and lets me record my albums for mp3 formatting. The biggest thing I love about my player is obviously the ability to record my albums into my computer and digitize them into the mp3 format. As I’ve said before, I have a rather large collection of vinyl albums because nothing beats the original form – even if I have an original and a digital repress (newly made) version of Fleetwood Mac’s Rumors album. 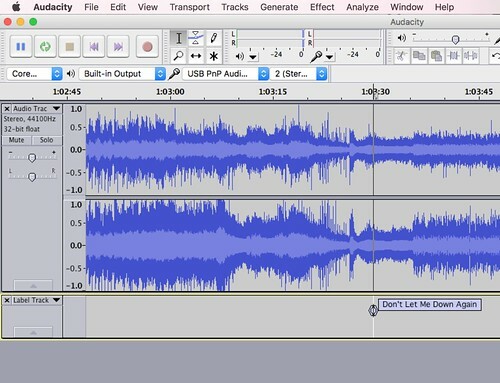 Using the Audacity program (pictured above right), I just switch to the USB Audio in the program so that it records via that and end up with tracks that look like what is in the picture. That’s pure sound, y’all, and it’s one of the best things about this record payer. This probably isn’t the only program to use for this sort of thing, but it is what the record player comes with so I’m content to use it for the time being. It’s just a process of listening to the album and decided where you want to cut off on songs. With this being a live album, it becomes all about placing the track titles in a good place between the applause and the start of the next song. 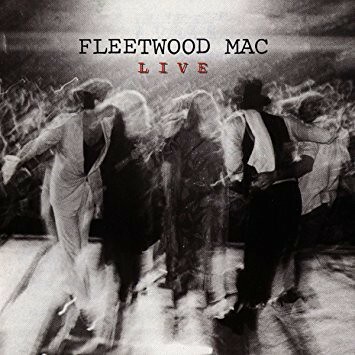 The album I’m currently working on is the Fleetwood Mac (shocking LOL) Live album. I’m addicted to them and probably always will be. But this is one of my favorite albums because of the amount of music on it as well as the mix of all their albums on it. Doesn’t help that “Rhiannon” opens with Stevie explaining that it’s the story about a Welsh Witch. But it’s a good album just in general and it’s one I’ve really been wanting in my iTunes but haven’t had time to really do any sound recording because of the length the process takes. But this record player has held up a year where my Crosley was already acting up and not wanting to play specific albums well. By this, I mean that they seemed to be playing slower than what they should at 33 speed. So the change was necessary and I regret none of it!